It seems like forever since I posted a new painting. I hope you find this worth waiting for. This Plains Indian wears a feathered Headdress with ribbons. Many years ago I was allowed into the Vaults of the Philbrook Museum in Tulsa. I was shown a beautiful old War Bonnet. What a shock to find that the crown was made from a Stetson felt hat!! 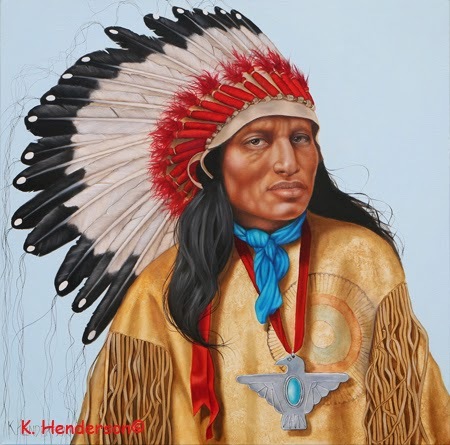 This Plains Indian wears an eagle feather headdress or War Bonnet, a painted buckskin shirt and a silver Thunder Bird. 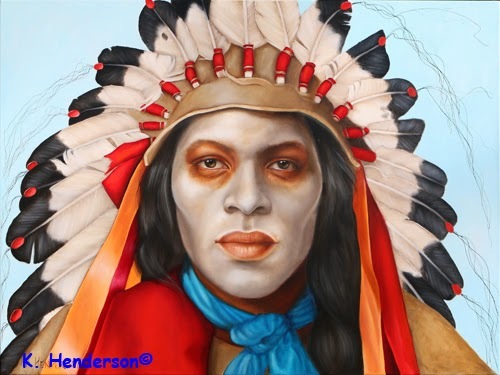 Feathered war bonnets are worn by honored Plains Indian men. The bonnet had to be earned through brave deeds in battle and each feathers signified the deeds themselves. 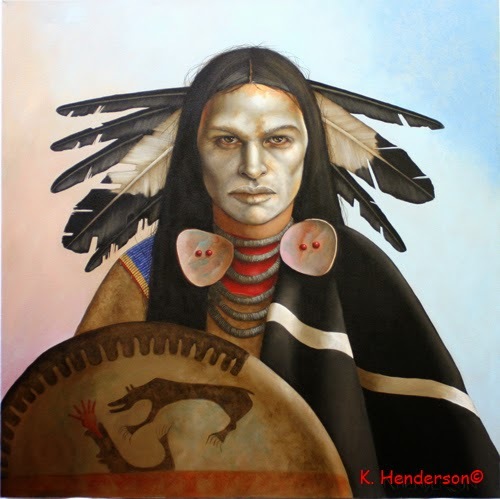 The golden eagle, also known as the “war eagle,” is particularly associated with warriors and courage in battle, and it is golden eagle feathers that were earned by Plains Indian men as war honors and worn in their feather headdresses. The Eagle flies higher and sees better than any other bird. Therefore, its perspective is different from other creatures that are held close to the Earth. The Eagle serves as a messenger between humans and the Creator. The Creator chose the Eagle to be the leader of all the birds... the Master of the Sky. What does the Face paint mean? Click Here! Be the first to see my new paintings.